Posted 9/20/2008:additional information on the new CS! 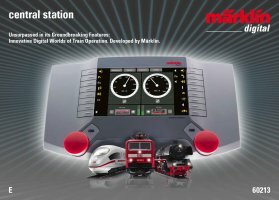 The new Märklin Central Station, created by specialists from the Märklin Electronic Development Department, covers more possible applications than all other systems known up to now. It is another large step into the easy-to-use future of control of complex model railroad layouts and it offers a maximum of fun, even on smaller layouts. 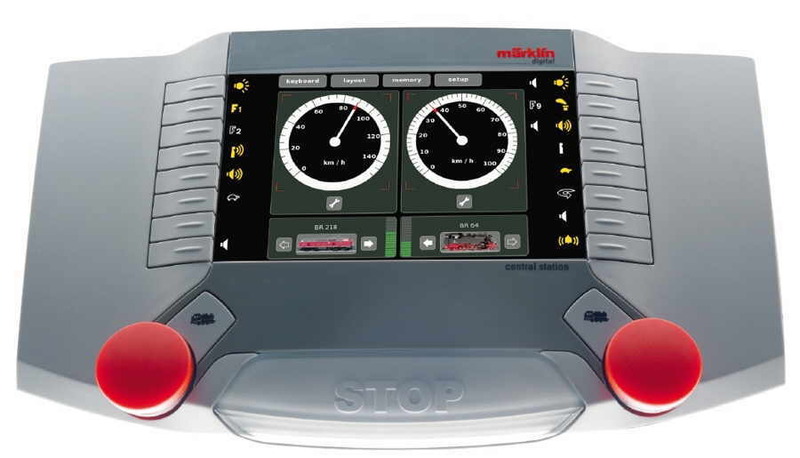 Another unbeatable advantage of this trail-blazing central controller is its compatibility with the digital control components of Märklin's earlier digital systems. You can continue to use all of these components and they can be incorporated into the new system. 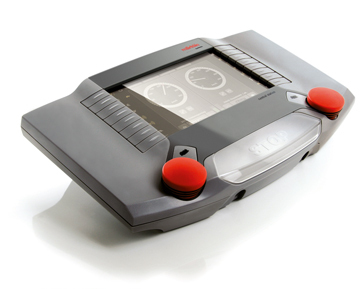 The Märklin digital formats for the 6021 Control Unit as well as the current mfx format are supported by this central unit. This controller has been newly developed from the ground up and has a color display and 2 built-in locomotive controllers that show the speed for locomotives on round tachometers. A color image of the locomotive being operated can be shown beneath the tachometers if desired. Depending on the type of decoder, the locomotives register themselves automatically (mfx locomotives), are selected from a built-in database (Märklin Delta and Digital locomotives), or are manually set up. The control surface necessary for this is very easy to comprehend and is designed to be manageable. It is also possible to take in locomotive data from cards resembling bank cards by means of built-in card readers on the Central Station. An individual information card with all of the relevant data can be set up for each locomotive. This simplifies registration of a locomotive on someone else's Central Station or selecting a locomotive again while operating another unit. The configuration of the individual locomotive parameters is done with an operations menu just for this purpose, in which a model railroader without a technical background can determine the running characteristics of the locomotive to meet his needs. The acceleration and braking delay can also be set for earlier Märklin Delta and Digital models without high-efficiency propulsion. This control feature is then taken on by the Central Station during operation of the locomotives. If you like, locomotives can also be used in automatic shuttle train service with 2 endpoints and an intermediate stop. The control knobs and function switches are ergonomically designed and are easy to use with their special surface design. Built-in detent steps give you a precise feel for the position of the control knobs when you are turning them. The function switches feature a definite on/off point. The booster built into the Central Station provides a maximum output current of up to 3 amps. If you have a larger power requirement on your layout, you can use either the 6015 or 6017 Booster offered in the past or the new 60173 Booster. (More information on the 60173 Booster will be available later in 2008.) The 60173 Booster has been designed for optimal operation with the Central Station. For example, the output voltage, the output current, and the temperature of this booster can be monitored by means of an indicator on the display for the new Central Station. Twenty built-in solenoid accessory controllers (keyboards) allow you to try out solenoid accessories in a direct, straightforward manner without entering these accessories in the Central Station. The control surface for this application area can be adapted to existing types of solenoid accessories (turnouts, signals, etc.). The Märklin digital turntable can also be controlled with the new Central Station. 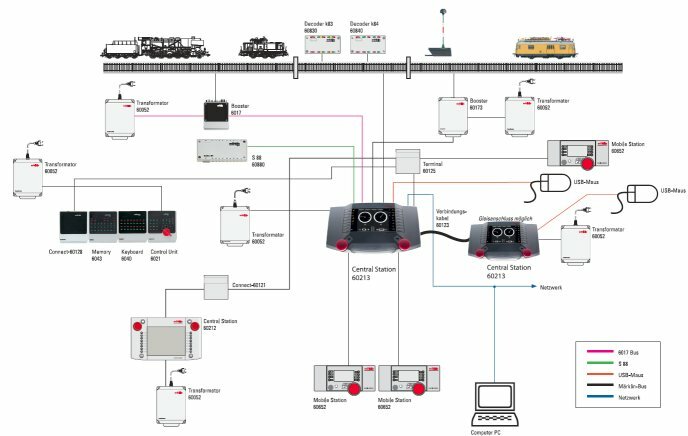 Thirteen built-in route controllers (memory), each with 32 routes, can be activated manually as well as by trains by means of the s88 feedback module. Automatic or safety circuits such as block operation, staging yard control, etc. can be set up just as easily as easy-to-use layout control whereby operation steps always taking place in the same order can be done by pressing a button. A track diagram control board (layout) is being built into a Märklin multiple train central controller for the first time. The individual switching elements for solenoid accessories and the routes from the Memory as we l as s88 feedback contacts are included in this control feature. This control surface represents the best in layout control in terms of manageability and ease of operation. The track occupation detection feature lets you know whether a train is on a particular area of track. This is a real increase in safety for concealed areas of your layout. The Ethernet connection allows you to connect a personal computer to the Central Station, and a computer mouse, a computer keyboard, or a memory stick to back up Central Station settings can be connected to the Central Station via the USB host. A personal computer is therefore no longer absolutely necessary to back up individual layout data. A simple USB stick is enough for backing up data. In addition to other 60213 Central Stations as auxiliary controllers, the Mobile Station can be connected to the new Central Station, and the older 60212 Central Station and/or the 6021 Control Unit with the controllers connected to them can be connected to the new Central Station by means of special adapters. This means you can continue to use these units. The control surface for your entire model railroad layout can therefore be tailored to your own wishes and needs. Also, operation by several people is not a problem. An appropriately broad spectrum of control setups can be realized from the stand-alone solution for a small layout to networked control boards on a large layout. The Central Station can be updated easily in the future over the Internet or by means of the appropriate data in a USB stick. This complete process was designed so that even users without knowledge of a personal computer can easily do this on their own. The new Märklin digital Central Station therefore comprises more than 37 individual components that had to be purchased separately on the previous digital system. This does not include the new track diagram control boards that were previously not available in this form. The #441-60213 Central Station will be available from authorized Märklin dealers in the 4th quarter 2008. Manufacturer’s suggested retail pricing will be announced in mid-September.